Saponification is a chemical reaction between oil and lye when making soap. Once it's complete there's no lye left in the mixture. It’s important to follow, proven, soap recipes. Each type of oil requires a different amount of lye to produce the complete reaction. There should be no substituting oils in ANY soap recipe. Use the exact oil specified. If you want to use different oils then the amount of lye will be different too. Each soap making oil has a specific saponification value. The value specifies the number of lye molecules needed to turn a molecule of oil into soap. Leave just a few molecules of oil, unsaponified, so we know all of the lye has been reacted with the oil. CAUTION! If there's extra lye left in the soap, it will be harsh and will damage your skin. Allow up to three weeks for homemade soap to cure, before using it. 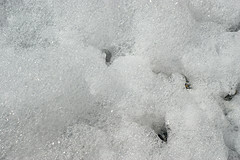 When making homemade soap consider saponification values for homemade bar soap, (NaOH) and homemade liquid soap, (KOH). The saponification chart, (shown below), lists various oils and properties. There are two facts to consider before using this chart, determining varying outcomes. 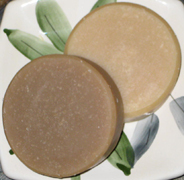 Your mileage can vary making goat milk soap. SOAP MAKING NOTE #1: Homemade soaps are formulated with a combination of emollient oils and butters, with lathering oils. For example, Olive and Avocado are popular emollient oils. Cocoa and Shea butters are wonderful! Coconut and Palm Kernel oils are super for lathering. All of these oils are mixed with liquid saturated lye. SOAP MAKING NOTE #2: Essential oils are concentrated. They carry a distinctive fragrance or "essence" from the object from which they were extracted; plant, leaves, peel or flower. Essential oils must always be diluted in carrier oil, soap, lotion or other buffering agent. Never use large amounts externally or internally. Never use them straight. Argan Y FL, SL Y .134 oz. .188 oz. Avocado plus oils FL, SL Y .132 oz. .186 oz. Babassu Y FL, SL Y .176 oz. .248 oz. Camellia Y FL, SL Y .134 oz. .189 oz. Castor High% soft SL Y .127 oz. .179 oz. Ultra Ref. Cocoa Butter Y SL Y .136 oz. .192 oz. Organic Coconut Y FL High % - dry .178 oz. .252 oz. Emu Y FL, SL Y .135 oz. .191 oz. Flaxseed plus oils FL, SL Y .135 oz. .190 oz. Grape Seed High% soft SL Y .134 oz. .188 oz. Kukui Nut plus oils SL Y .135 oz. .191 oz. Lard Y SL Y .141 oz. .199 oz. Macadamia Nut plus oils SL Y .137 oz. .193 oz. Palm Kernel Y FL Y .178 oz. .250 oz. Pumpkin Seed Y SL Y .134 oz. .189 oz. Rice Bran Y SL Y .133 oz. .188 oz. Rose Hip plus oils SL Y .133 oz. .187 oz. Safflower plus oils SL Y .135 oz. .190 oz. Shea Butter Y SL Y .126 oz. .178 oz. Soy Oil Y SL Neutral .134 oz. .188 oz. Sunflower Seed plus oils SL Y .134 oz. .189 oz. Tamanu plus oils FL, SL Y .148 oz. .208 oz. Walnut plus oils FL, SL Y .136 oz. .192 oz. Wheat Germ plus oils SL Y .135 oz. .190 oz. The following acidic ingredients, in soap making oils, promote different properties. Consider the % of each acidic ingredient, for making the proper choice. Learn how to make soap with homemade soap recipes.